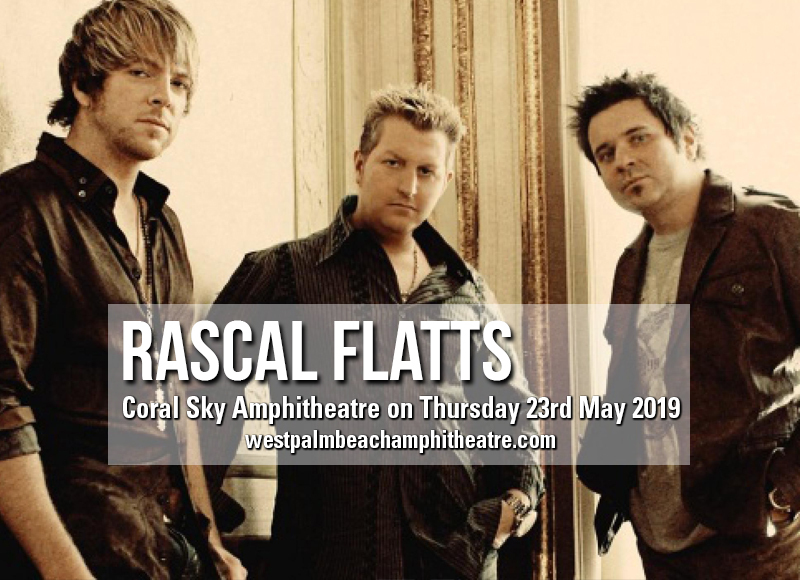 One of the most exuberant live acts is coming this way to the Coral Sky Amphitheatre on Thursday 23rd May 2019. A certified crowd-drawer, the Rascal Flatts carry an infectious vibe that easily spreads out from one then onto millions of fans in an instant. Hence, once word gets around that they are hitting the road, ticket bookings come flooding in. The Rascal Flatts have been around for quite some time yet their musical brilliance shines brighter than ever. The striking balance between their commanding yet very heartwarming stage presence makes fans come back time and time again to their live shows. Don't fall flat on your face with regret of missing this show. Go on, get your tickets now! This 3-piece country-rock band from Ohio who christened themselves the Rascal Flatts, have come a long way since their chance discovery by veteran singer/songwriter Mila Mason at a nightclub, who in turn, recommended them to a producer friend who readily offered them a recording contract. Such fateful event led up to an astonishing stack of 45 awards for a career spanning 15 years. Some of these awards include the Academy of Country Music award for "Best New Vocal Duo or Group" in 2000 and the Country Music Awards "Vocal Group of the Year" honor in 2003, 2004, 2005, 2006, 2007 and 2008. The Rascal Flatts have released nine studio albums which spawned 26 chart-topping singles. Some of their monster hits include "Prayin' for Daylight" (2000), "Skin" (2004), "Bless the Broken Road" (2004), "Life is a Highway" (2006), "Here Comes Goodbye" (2009) , "I Won't Let Go" (2010) and "I Like the Sound of That" (2016). To say the Rascal Flatts is a concert crowd-drawer could be an understatement. Concert sales and attendance have posted staggering statistics and dollar values, yet a close estimation would be a career-high of celebrating a career milestone of raking in 10 million tickets sold. But the band has not stopped to count and rest on their laurels. They are still tirelessly touring the world and delighting fans everywhere with their live shows. Be part of this momentous celebration and keep the party going with the Rascal Flatts.